The plain glass crystal chandelier decorated with cut crystal drops. Price exclude VAT. Tax will be updated during checkout based on your billing and shipping information. Would you like to change the selected chandelier? 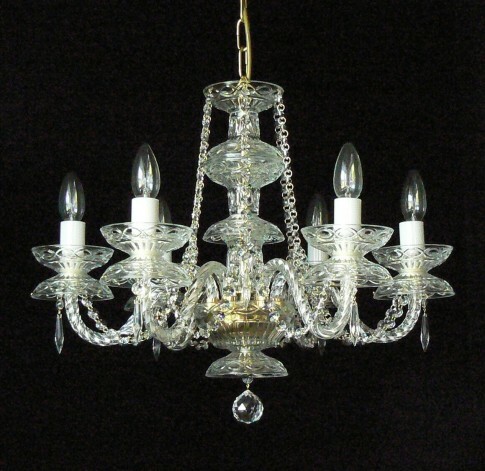 We can adjust the size of the chandelier, number of bulbs, quality, color and type of crystal trimmings, metal finish, height of hanging of the chandelier and the like. I want to adjust .. 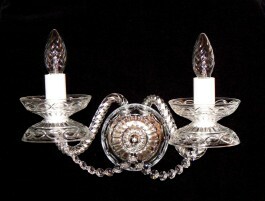 The design glass crystal chandelier with 6 profiled twisted glass arms. Metal finish - polished brass. Dimensions (W x H): 53 x 45 cm/ 21.6"x18.4"